Big names, fast cars, and lots to learn! The perfect environment for any budding engineer. Formula Student is a global educational engineering competition with the main event held at SilverStone Race circuit. Backed by industry and high-profile engineers, the competition aims to develop enterprising and innovative young engineers and encourage more young people to take up a career in engineering. After coming 47th out of 81 last year, with very little funding just lots of hard work, we aim to continue even higher up the rankings. Based here at the University of Exeter, XRacing are committed to managing, designing, building and racing a car alongside our studies. We are made up of students from a range of years and disciplines from year 1 undergraduates to final year PhD students. Last year saw our best ever competition finish. We overcame a number of technical difficulties at the event and were pleased to place 47th out of 81 teams. We are looking to build upon this success and our aims and ambitions are to become a top-level competitor. We currently have very little funding available to support the project and are looking to raise money to help us succeed in this year’s competition. Money raised will help us to get further in the competition by enabling us to buy essential tools and equipment, as well as covering some of the costs incurred to attend the competition itself. As you can see we are looking for donations of all sizes – even £5 could help us enormously. 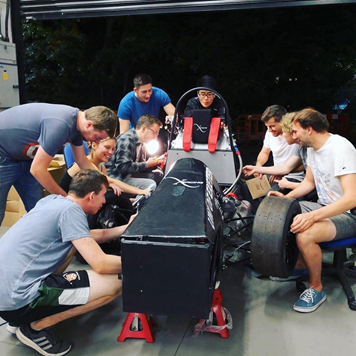 Please give what you can in support of Xracing, the Formula Student at Exeter university – we have some great rewards on offer to thank you for your generosity! Thank you! Please help the next generation of students complete their goals in getting the best Xracing result to date!